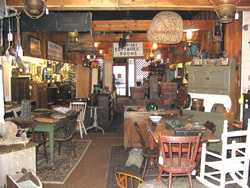 Greenwich Hardware Antiques is a sole proprietor shop established in 1990. When you talk to us, you're always talking to the owners. Our specialty is early country furniture and accessories in original surface and as found condition from the late 1700's through the late 1800's. All pieces are very nicely displayed for your viewing pleasure on two floors and in an attached barn of our 1860's village building. Our building was originally home to a general store, a hat maker, and yes, a hardware store. You can't miss the old stained glass sign on the front of the building. We are closed several days during the week for buying - so there is always fresh merchandise for you to look at. Check our "Hours" page for specifics. The other days of the week I am in the shop to answer any question you may have about things on the website and in the store. Our sales philosophy is high volume not high mark-up. We offer good deals to both our wholesale and retail buyers and sellers.